An eBook is an electronic format of a book to read on eReader devices such as a Kindle or iPad. The eBook is an important piece of the overall publishing platform, and the demand is greater than ever. WHY USE THOMSON-SHORE FOR YOUR eBOOK CONVERSION? In order to reach a broader audience, you may want to consider an eBook as part of your overall book package. eBooks offer many helpful features such as bookmarking, notes, highlighting and search functions. They also offer a built-in dictionary similar to a web search engine. 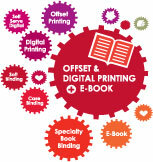 We make it easy for you by keeping all of your book production needs under one roof. It makes logistical and financial sense. Our publishing services team can perform eBook conversion from your original manuscript or design files to create high-quality EPUB and MOBI files that will work with all major eBook platforms. We can even help with eBook distribution. What is metadata? This is the information that accompanies every eBook to help identify the book. The information includes the title of the book, author, publisher, creation date, and ISBN. Why did the text format change from the file that I provided? This is common with eBooks as a result of the conversion process. Also worth noting, this process doesn't support running heads and page numbers because of the reflowing that occurs within the readers that give the viewer the opportunity to change the justification, the font style, and size. Is a separate ISBN required for eBooks? Currently, only the Apple iBookstore (iPad) requires a separate ISBN. However, for tracking purposes we recommend that you obtain a separate ISBN.